One of my most commonly used quilting tools can be created by using less than $20 of supplies from your local hardware store and about 5 minutes of your time. Without fail, this tool gets used on every one of my quilt projects so I thought it was high time I showed it to you. I'm not sure if there is an official name for this somewhere, but I call it an Acrylic Design Board. 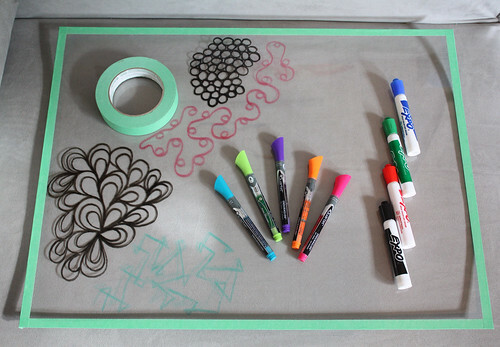 The ingredients are simple, all you need is a sheet of acrylic from your local hardware store, some painters tape and some non-permanent white board markers. Home Depot sells the acrylic sheets in various precut sizes, the that one I show here is 18"x24" (which I picked up for $12). Here's a quick link. 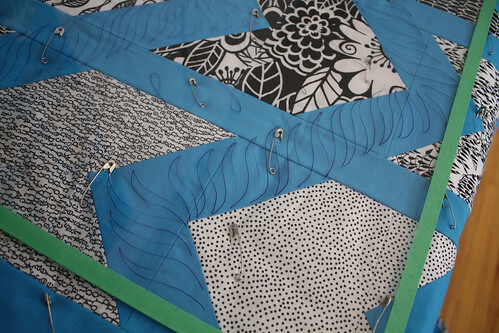 When I first began quilting I was a bit intimidated by FMQ, and by intimidated I really mean terrified. 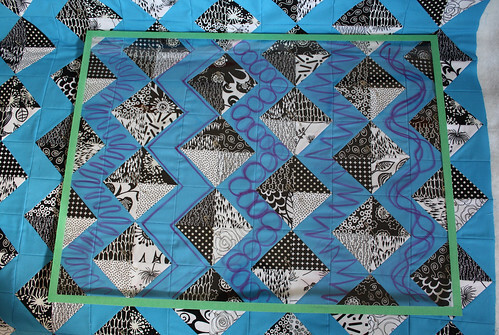 After completing a couple of quilts though I realized that part of what inspired me to quilt in the first place was all of the beautiful FMQ out in the bloggisphere, and it was high time for me to give it a go. 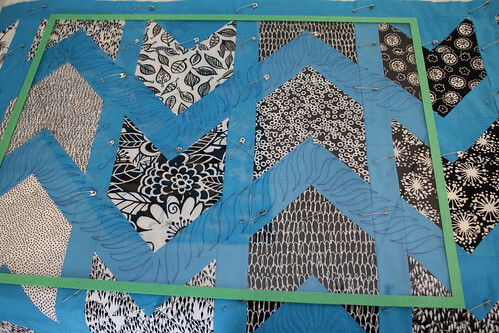 The best way for me to decide on a FMQ design on any quilt it to test it out first, so I use markers on my acrylic design board to visualize what effect various stitching will give to my quilt top. Once I settle on a design, I wipe the board clean and sketch it out a few more times until I feel confident in the motion. I don't transfer the markings, I just remove the sheet and start quilting. Be careful when moving the board around though as not to smudge any marker on your quilt - it can create a terrible stain. On more complicated designs I will often prop the board up close to my machine, which lets me easily compare design size and shape. While I'm a novice quilter and still have a LOT to learn, I find that this tool makes new techniques and designs more approachable and a lot less scary. This tool has really helped me to push from my comfort zone and try new things. Hopefully you can find some benefit from it too. so so so brilliant! I am about to try to take my FMQ up a notch and I am so thrilled to read this post before I do that. Thank you! I love the quilt in your example too and I think it is in my flckr favorites. What a great idea! Thanks for sharing! From A - Home at Last! © Everyday Fray, 2012-2014. No unauthorized use of this material without express written permission. Powered by Blogger.